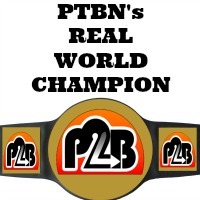 In this multi-part series, the staff members of Place to Be Nation have to come together to argue who the true Real World Champion of North American wrestling was in each year from 1983 through 2014. We factored in workrate, drawing ability, influence and general overall presentation, acceptance and cache. After intense debates, we chose our Champions for each year and submitted a writeup explaining the choice and also offering up the top matches each Champion competed in that year. On with the roll call! I have been a wrestling fan for a long time, but I would hard pressed to find a wrestler that I enjoyed watching and marking out for more than Kurt Angle in 2001. After a strong rookie campaign in 2000, Angle went next level almost immediately. After a tough loss to the Rock at No Way Out, he engaged in a bitter feud with Chris Benoit that produced a series of top flight matches. After annihilating Shane McMahon in a grotesque street fight at King of the Ring, Angle took a few weeks off to rest up and that is when he really took a step forward from a character standpoint. He would deliver memorably hilarious promos and backstage segments with Steve Austin as the two battled for the love of Vince McMahon. 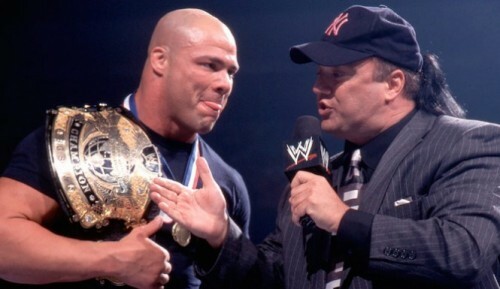 Once the Invasion kicked off, Angle became the face of the WWF and pushed Austin to the limit at SummerSlam before capturing the title in a swoop of Americana at Unforgiven. In between those matches, he delivered an all time classic moment by giving the Alliance a milk bath. His title reign may have been short, but he was still heavily featured in the main event picture to close out the year. I would argue that Angle had about as perfect of a year as you could have in a WWE ring when you factor in workrate, status and character/promo work. It’s damn true. Following a seismic shift to the pro wrestling landscape in 2001 with the closure of WCW and ECW, 2002 continued the reshaping of the industry, as TNA and ROH began their fledgling runs while the WWF morphed to WWE and struggled to find a consistent identity in the wake of seizing a virtual monopoly. The primary sports entertainment brand would lose flagship performers like Steve Austin and The Rock while new talents such as Brock Lesnar began their ascent to the top. Through it all, nobody delivered the consistency and adaptability WWE and wrestling as a whole needed like Kurt Angle. After rehashing an old feud with Triple H to kick off the year, Angle proved his worth as a team player in the late winter into the spring, polishing a low profile feud with Kane into an unexpected gem, and then helping to elevate Edge to main event status. “The Olympic Hero” saw his hard work, and shaving of his rapidly thinning hair, rewarded at the King of the Ring event with the rarest of submission victories over the legendary Hulk Hogan. As the brand extension between Raw and SmackDown attempted to take the place of genuine competition throughout the industry, Angle became a cornerstone of the “blue brand,” helping to differentiate it as the showcase for athletic competition over camp entertainment. Following a classic triple threat with the Rock and the Undertaker over the Undisputed title at Vengeance in July, Kurt would welcome former WCW stalwart Rey Mysterio to the WWE fold by putting on one of the company’s all-time best opening matches at SummerSlam. In the fall, Angle renewed his rivalry with Chris Benoit, providing another memorable encounter at Unforgiven that allowed SmackDown booker Paul Heyman to showcase the style he had been cultivating over the summer. The two rivals would then enter into an unlikely partnership and become the inaugural WWE Tag Team Champions, kicking off a three-way feud with Edge & Mysterio as well as the Los Guerreros tandem of Eddie and Chavo. This sextet would form the “SmackDown Six,” a still-revered group of elite grapplers who could be thrown together in an combination over several months and put on must-see wrestling. After dropping the Tag titles, Angle refocused on his singles career and wrapped a successful 2002 by defeating The Big Show for his third WWE title and priming for a money showdown with Brock Lesnar. Kurt Angle not only put on great matches throughout 2002, he rolled with whatever the powers that be handed him and made the most of it, whether that meant playing to the strengths of Kane or making an aged Hulk Hogan look like a legitimate threat. Perhaps most valuable on a larger level, Angle unselfishly made stars, catapulting Edge to the top tier where WWE badly needed him or ensuring Rey Mysterio would not suffer the credibility killing WCW castoffs before and after him endured. 2003 was a real transition year for WWE, as many of the Attitude Era stars were beginning to finally fade away and thanks to the brand split, the company was in dire need of top new stars. Lesnar had burst on to the scene in mid-2002 and it was immediately clear he was going to be a stud. After turning face in late 2002, Lesnar was set to become the alpha dog of the company, the beast to lead the promotion for the next decade. He would win the Royal Rumble match and then knock off Kurt Angle in a classic battle to capture the World Title for a second time. He became the steadying force on SmackDown, battling opponents big and small until Vince McMahon got in his ear and turned him heel over the summer. His feud with Angle would reignite and he traded the title back and forth in memorable matches before regaining it for good and settling down heading into the fall. After dispatching of Undertaker at No Mercy, Lesnar rolled in 2004 as the dominant champion on Thursday nights. 2003 was a great year for seeing a true rising star cash in on his grand potential and becoming a mega star in the process. Oh, and he was a physical beast that possessed superior workrate and top notch in ring psychology skills. The Next Big Thing for sure. Ring of Honor was a promotion built on presenting an alternative. This initially was found in the presentation of the code of honor and the highly athletic indy style presented in ring. ROH found some of its greatest success in the first half decade of its existence by utilizing a proven wrestling promotion method that had fallen by the wayside: the long reigning World Champion. Samoa Joe started his reign in March of 2003 and had successful defenses throughout 2003 against Homicide, Christopher Daniels and Paul London. 2004 is the year where Joe really came into his own and not only was he the most credible world champion in the world, he also was one of the best in-ring performers. The list of matches for Joe in ROH throughout the year is an impressive resume of talent. A bloody steel cage match with Jay Briscoe, a blood feud with main rival Homicide, some technical masterpieces with Bryan Danielson and the incredible three match series with CM Punk. The first two matches of that series resulted in two 60 minute draws. The latter was rated ***** by Dave Meltzer. This helped solidify ROH and Samoa Joe as the face of the brand. The final event held for ROH in 2004 saw Joe losing to Austin Aries in a match where Joe tried to create a new star even though the result would inevitably be shocking since his title reign was coming to an end. In addition to Joe’s ROH accolades, Joe travelled the U.S. and became as close to a travelling World Champion as you could in modern day wrestling. Joe had great stints in Pro Wrestling Guerrilla and Independent Wrestling Alliance Mid South matching up with promotion favorites like Joey Ryan, Chris Hero and Super Dragon. Samoa Joe presented himself as the true champion in the industry of wrestling and had a standout year raising awareness for indy wrestling in general.